N341ZL is a civilian model SA341G with Astazou IIIA engine. It has spent time in the USA, France, UK and Canada.Currently under maintenance for re-registering in standard airworthiness category in the USA for Part 91 use only. The aircraft has very low hours on the airframe and over 1400 hrs remaining on the engine with excellent times remaining on key components. Straps and cross-tube ADs recently done also. The aircraft also has an auto pilot and additional fuel tank. With the ship also comes an AC unit that is not installed. The Aerospatiale SA.341/342 Gazelle is a five-seat light helicopter that first flew in 1967, powered by an Astazou 3 engine. The first production aircraft flew in 1971, differing from the prototype in having a longer cabin, larger tail unit and updated Astazou 3A. Ten versions of the Gazelle have been built: the SA.341B, 341C, 341D and 341E for the British armed forces; the SA.341F for the French Army; the SA.341G and SA.342J for civil operators; SA.341H military export version; and the SA.342K, 342L and 342M military versions. 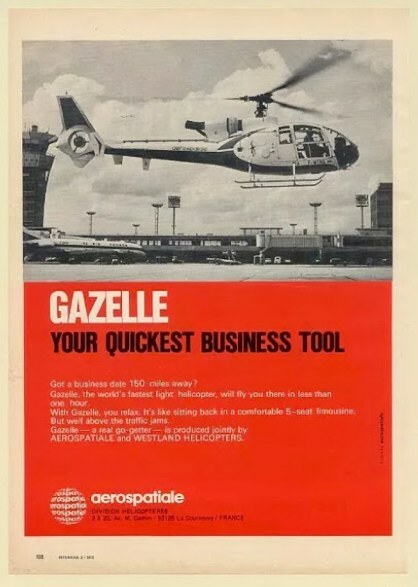 Under an Anglo-French agreement signed in 1967, Gazelles were produced jointly with Westland sales have exceeded 1, 200. This aircraft is available for sale with custom exterior paint, custom new interior, seats, carpet, headliner and paint and new radios and electronics including a Garmin 750 GTN GPS/NAV system and Garmin 335 transponder with ADS-B. It will be one of a very few Gazelles with IFR certificate. 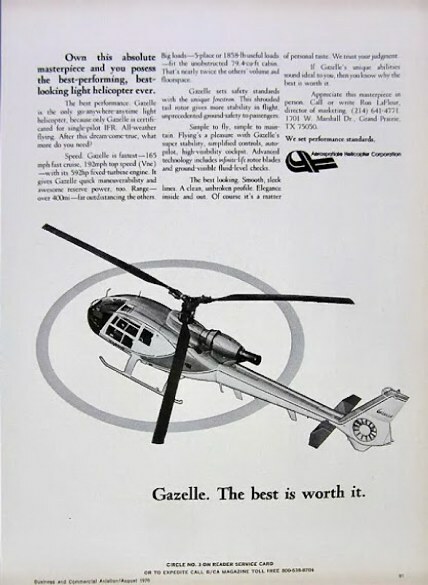 The Gazelle is the only single engined helicopter certified for IFR and is grand fathered in from its original certification. Current regulations require twin engine and dual hydraulics to certify for IFR.  Armament 2 x 7.62mm machine guns (not a standard fitting). interior and electronics or ..... the yellow one is almost ready to go..